We use this side out-of-bounds play vs. man defenses. We initially set up in a 2-3 set. Player #3 always throws the ball in when we take the ball out on the sideline. Players #1 and #2 cross, and #4 v-cuts and flashes high. Player #3 throws the ball in to #4. 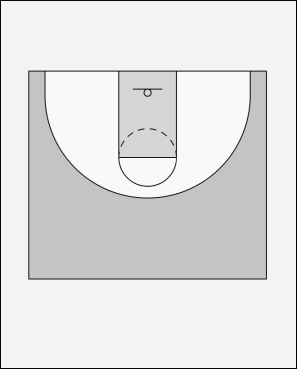 Player #1 can pass to #3 coming of a screen set by #2. Or player #1 passes #2 coming off the staggered screens set by #5 and #4. In this case the ball goes to #2 for the inside shot.